Sulekha.com is the biggest creative and vibrant online communities of Indians was established in 1998 at Austin, Texas and has strong reach amongst online Indians and NRIs around the world serving 60 cities. Sulekha's members and Sulekhas team (in Austin , Chennai, Seattle , Bangalore , Hyderabad and Mumbai) have developed Sulekha into a global Internet franchise serving Indians with multiple dominant competitive positions. Sulekha permits members to share a community of global and local interests and needs. Driven by simple vision of Connecting Indians Worldwide, Sulekha brings individual together with other individuals and organizations. SulekhaB2B.com is one of the fastest growing services of Sulekha having 1, 00, 000 + Indian Manufacturers, Exporters, Importers, and Service providers. Sulekhab2b helps you to change the out look of your business by generating more and more fruitful business and getting an edge over your competitors. SulekhaB2B.COM provides a host of valuable and synergistic services to promote our clients to get maximum response worldwide. The promotion is done through Search Engine Optimizations, Association Tie ups and Partner Links. Sulekhab2b partners with 100 + associations and websites to drive targeted reach for your B2B needs. 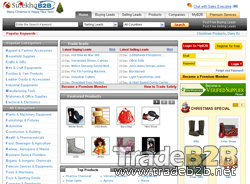 Search Engine Optimization (SEO) for product catalogues and premium directory offerings. Ad words and Overture based targeted keyword search based reach in Google, Yahoo and MSN. Multiple entry points into Sulekhab2b through news, directory, trade offers being indexed by search engines. About SulekhaB2B.com - B2B International Directory for Global Manufacturers's recommend,only on behalf of the views and opinions about B2B Directory, if you have any suggestions , please feel free to contact with us, we will amend and correct them in the first time according your suggestions. More better B2B Websites recomend, Please click here.